Hi once again I am sneaking in at the last moments. I have a friend who loves black, so this one is perfect for her. Muse is celebrating their 200th challenge and Jenni Murry has given us a sweet floral card. I fell in love with those dots...seriously darling backdrop for that sweet bloom. 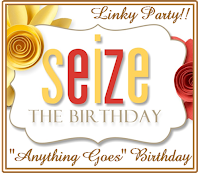 At Seize the Birthday anything goes, and the optional topping is dashes and doodles. I'm calling the dots on my flowers doodles although the stamp comes dotted. My card uses a Cuttlebug swiss dots embossing folder, the flowers and sentiment are from Hero Arts, and the banner die is from PTI. Hi there, time to get another NBUS (never been used schtuff) item out. Along with using a brand new item, the optional technique is using a hidden word in Darnell's NBUS Challenge #9. My NBUS items are the flower stamp from Stampin Up's Avant Garden set. I also used new inks -SSS Hot Mama, along with HA Neon Purple, HA Passion Flower and Wplus 9 Bloomsberry. The die is from Winnie and Walter. I mounted the "thanks" on some hot pink fun foam so it sits up just a bit higher. The foam is very similar to the brightest color of the stamped flowers. I also added Spectrum Noir clear Sparkle pen to just the word thanks. Some gems - cause I can't seem to resist them lately and the card is finished. I can't believe I haven't played this challenge before with my love of flowers. 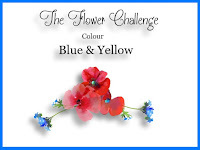 This week the theme is blue and yellow at The Flower Challenge. I pulled out my freesia stamp from Altenew and a PTI die cut and went to work. I used water color pencils for the coloring and Versafine for the ink portions. The sweet little bow was cut with an Avery Elle die. I have been leaning more towards gems lately than sequins...I wonder why that is? Here goes a bit of reaching, I know. 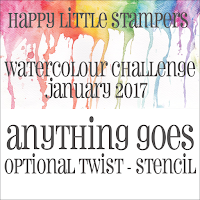 I have one card that I am entering to all four of the HLS January challenges. 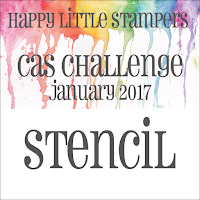 HLS Watercolor challenge - Optional Twist Stencil, HLS Mixed Media Challenge - Layers, HLS Anything Goes with Dies, and HLS January CAS Challenge - Stencil. I think it is possible to put them all together. The Altenew flower is colored with watercolors by way of the Zig Clean Color Real Brush pens. The background is lightly stenciled using Tim Holtz' Burlap stencil and some antinque linnen distress ink. My sentiment is the handwritten hello die cut from WPlus9 and it is layered on the focal panel which is then layered on the card base. It's my first time playing in most of these challenges, I love that there are several weeks for you to get your project done. A week or 5 days just seems to fly by before I get to a challenge these days. The first few paragraphs are how my idea came to be. If you just want to cut to the chase scroll down to the italicized text. One of the crafty ladies, Peggy, who has become a really good friend in the past six months or so surprised and delighted me today. She sent me this card in the mail. My breath caught when I opened it. I loved it so much...its got my favorite color and one of my favorite stamps. She decided she wanted to get back to coloring and she wanted to try some flowers, so I offered to bring mine over. Most of her stamps were critters and holiday related. So we spent several hours stamping out my stamps on her papers - water color, bristol, and copic friendly. You guessed it this is one of the pieces we stamped out that day, and I am thrilled she sent it to me after coloring it so beautifully. That's the funny thing about what we each buy...we buy what we like...but I am betting we most often send it off to others, we get our pleasure from making and working with the stamps. Send me a stamped piece or your favorite die cuts cut out, and I'll send you back a card with your favorites on it. I will also send you a favorite of mine for you to play with and return to me. Now I know not everyone likes the same techniques...some love stamping solid images, some love coloring, some love die cuts, some love paper piecing. If you have a preference for what I send you technique wise...tell me. I am happy with it all. If you want in on this let me know anytime by sending an email to catluvspaper at gmail dot com. I'll be in touch and we'll do a swap! It has been several months since I last scrambled, partly my travel schedule and partly the holiday break in the scramble schedule. The scramble is hosted over at the Hero Arts Flickr group. Today our hostess is Karen. She tasked us with creating a card with our oldest Hero Arts stamp and using something around the house to create a background. I grabbed some of that grippy shelf liner, the kind that is a bit spongy and is not solid. I placed it on water color paper then spritzed water all over it. I lifted it up and dumped some purple brusho on the semi wet card. YUCK...it did not turn out at all as I imagined it. So I tamped the shelf liner on the water color card to get more water on it for the brusho to spread. Still YUCK...BUT then the shelf liner had color on it and I decided to lay that on a fresh piece of watercolor (not really I just turned the other piece over after heat setting it). Yay, finally a background I liked and could work with. My oldest Hero Arts stamp...or at least one of the first ones I bought is the Hydrangea. It is still a favorite and is on display in my craft space. I heat embossed it in white on thick vellum, then fussy cut it. I used stragetically placed foam to mount the vellum piece and added a sentiment banner and sequins. I am quite happy with how it turned out! I love it when I can combine a couple of challenges. Darnell is having a NBUS challenge, this week and next week and the week after. This week the NBUS Challenge is to color on Kraft. Check it out at her blog. 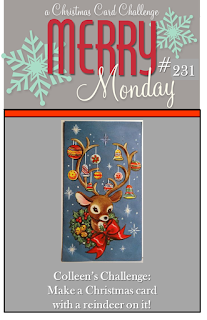 Merry Monday is having a prompt that I couldn't resist as I am still crushing on a particular holiday stamp set with the most adorable lil reindeer. I like the more masculine tone Kraft can give a project...since those man cards are often times difficult for me. My NBUS is a set of 72 prisma color pencils...not one of those points has seen paper so it was another perfect opportunity to play with some challenges and break them in. I softly colored the reindeer in shades of brown, grey, and a touch of red. I added wink of stella to the nose and the stars in the swirls and a tiny drop of black pico embellisher to the eyes to make them pop a bit. The layer was cut out with a Lawn Fawn die and mounted on a black cad base. All of the stamps came from Simon Says Stamp. This week at Muse 199 we have Tracey McNeely as our muse. Her card immediately reminded me of an MFT die I have, but have yet to use. What a perfect opportunity! I had colored some watercolor paper with Brusho Crystals. I had used all the pieces but one. I die cut the puzzle heart. I wasn't sure if the puzzle impressions would show in the photograph so I had to find a sentiment that did not rely on the puzzle aspect. The inlaid heart was covered with clear WOS, and then Glossy Accents to make it stand out, along with some foam tape, once it was placed back in the space. Looking through my stamps, I found a perfect sentiment from Penny Black. This set was given to me by a dear blogging friend Greta. 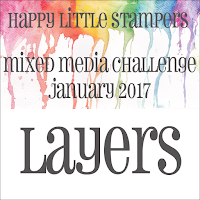 I loved the colors of distress ink Anita used on her inspiration card over at Muse. Picked Raspberry, Blueprint Sketch,Mermaid Lagoon and Cracked Pistachio. Yummy selection of colors. I kinda inverted it. In addition to her color choices, I was inspired by her round focal point and her curved sentiment. Hi there, I am slowly getting back into challenges. 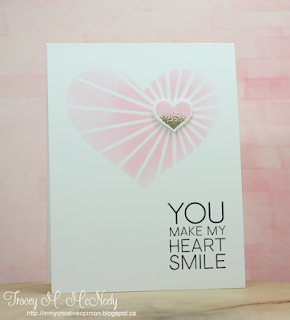 I love the trend over at Just us Girls, it is all over stamping. Sometimes I have no mojo for creating a scene and this is the perfect solution. My card makes use of two SSS inks, Versamark and Gold embossing powder. The stamp set is from Uniko for the background, the sentiment is from Altenew. After a month of traveling and getting over my cold, I finally was able to meet with the crafty ladies yesterday. I took along a couple of new stamps and a new set of watercolor pencils. I got the store brand at AC Moore, since I wasn't sure if I would like them so I didn't want to invest a lot of crafting budget in them. I needed a couple of birthday cards this month, and after checking my cubby...I needed a few more thank-you notes. Stamps are by Altenew, ink used is Versafine, sequins are Pretty Pink Posh, A Muse and Darice, glitter strips are from Michaels and CTMH. I put the cards together today, to maker sure they had dried fully. I did enjoy using the watercolor pencils...I need more practice and patience so I can layer in a bit more color after the first layer drys. I fell in love with these MFT polar bears. I promise to move on to another stamp set soon! Along with the new stamp set, I used my new watercolor pencils. I have to say...I kinda really like using the watercolor pencils. of Thanks...it is the season of thank you notes. I made up a set of 4 designs which I repeated that were quickly put together so that I could begin my thank you notes. Today I hope to get them popped into the mail as we are expecting a light dusting of snow tomorrow...I'll just want to sit by the window and craft while looking out; so the errands must be done today. I bought some $1 packes of notecards and envelopes at a big box craft store...and those note cards were really just a single cut of cardstock. No fold. There were however 20 excellent envelopes. I used the flats to die cut some speach bubbles, grabbed my gold foil 6x6 papers in my scrap stash along with some sheets of Kraft cardstock. These are small note cards 3.5 by 4.25 inches. A little difficult to photograph (sorry its so dark), but you get the idea. 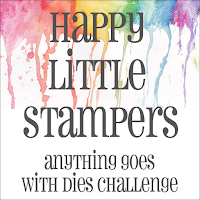 Sentiments come from Stampin Up. Thanks for stopping by! Do you have all your thank yous done? Hi Friends, I am back in Maryland after almost a month of traveling to see my Dad in California and the In-Laws in Ohio. I brought home with me a cold...its been years since I had one...2010 I think. I have finally passed the hacking up a lung phase and I think it is winding down now on day 6. I did not take a lot with me to work on crafting wise, but I brought along a set of 50 alcohol markers by Color It...the case sold me I admit. I had one last amazon gift certificate from 2016 gifts and decided to splurge. I don't like traveling with my copics. I stamped out several images and colored them up. This is a combination of an older Hero Arts sentiment stamp and some Uniko Flowers. I need to work on the placement a bit more but I love the idea and I have other larger sentiments stamps that could be prettied up a bit. As soon as I saw Sandy Allnock's cards with these MFT polar bears...well I had to have them. They remind me of the Coca Cola bears...whom I love! Okay so these MFT Elves are just adorable..and who says you can't use them year round? This one is going with a non-holiday gift to a girlfriend. The sentiment is fab! Another had to have stamp set. I am a reader, I love books so this stamp definitely caught my eye. During 2016 I wanted to read a book each week. The holidays and our travel schedule threw me off a bit. I only managed to read 41 books. I am going to give it a go again this year...hope I find some new authors to read. I love political thrillers, spy novels, sweet romances, and medical thrillers. I found a few new authors this year that I haven't completely read out. Are you a reader? Who are your favorite authors?